Deli-Pro Kitchen Knife only $5.51 w/ FREE Shipping! (reg $25) This has great reviews! Hurry over to Amazon to score a Deli-Pro Slicing Knife for only $5.51 shipped! To get this price, look on the right side of the page under "More Buying Choices" and buy from the seller The Natural Health Shoppe. This "miracle" knife has awesome reviews and can replace your bread, deli and carving knives. 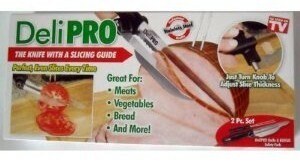 It easily slices through fruits/veggies, meat, cheese, bread and more!